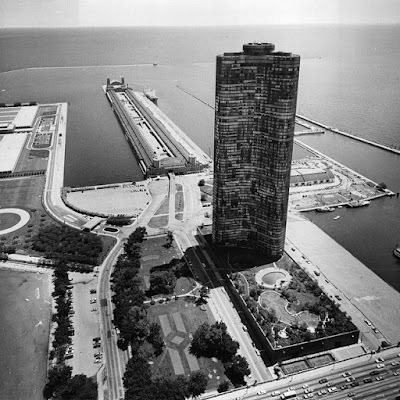 October 21, 1965 – The Chicago Tribune reports that Lake Point Tower, “a broadly curved three-winged high rise of 900 apartments” [Chicago Tribune, October 21, 1965] will be built east of Lake Shore Drive not far from Navy Pier. It will be the world’s tallest reinforced concrete building. The paper reports, “The tower, sheathed in glass and aluminum, will dominate a landscaped base structure covering the block bounded by Grand avenue, Streeter drive, Illinois street, and Lake Shore drive on the west.” Two developers – Harnett-Shaw & Associates, a New York firm and Fluor Properties of Los Angeles – will back the project. The land on which the building will be built is leased property from the Chicago Dock and Canal Company, a company that traces its origins all the way back to Chicago’s first mayor, William B. Ogden.